KK607 Totoral, Chile 200-300m. 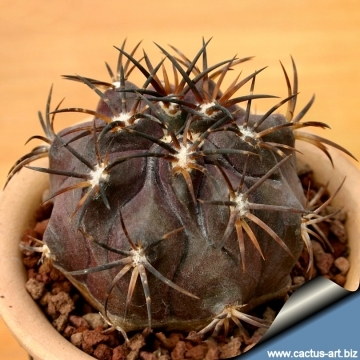 Very nice small growing plants with dark purplish-brown stem and thick curved amber-maroon /black spines. Really magnificent!!! 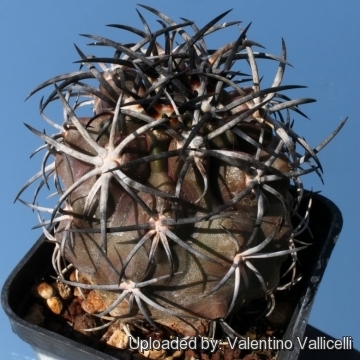 Description: Copiapoa dura is a local or morphological form of the widespread and variable Copiapoa echinoides. 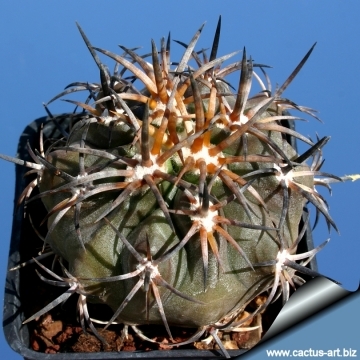 It has a dark purplish-brown stem and very thick curved amber-maroon to black spines. 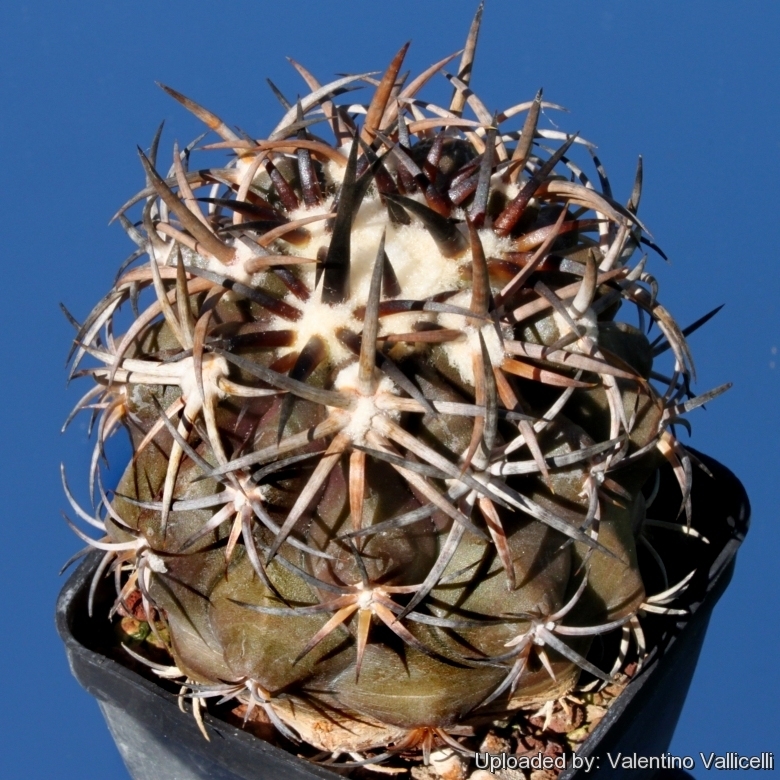 However the distinguishing characteristics of Copiapoa dura, appear to fall within the natural variation of Copiapoa echinoides and it should be synonymized with the latter. Habit: Solitary, or forming dense clumps. Stem: Spherical, firm, dark tannish-green to very dark-purple and woolly apically, 12 to 20 cm tall, 18 cm in diameter. Ribs: 11 to 17 , truncated. Areoles: Yellowish, becoming grey with age. 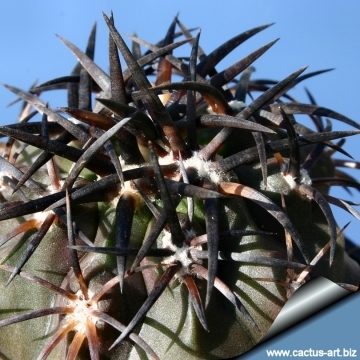 Spines: Maroon-reddish to pure black, straight or (usually) somewhat curved upward. 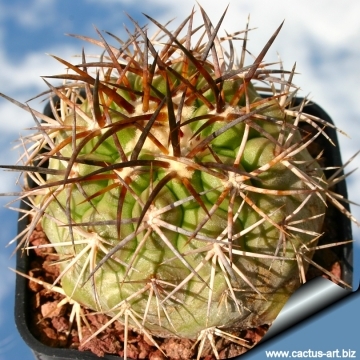 Central spines: 0 to 3, 1 to 3(-5) cm long. Radial spines: 5 to 10, 2.5 cm long. Flowers: Scented, pale yellow, 4 cm in diameter. Fruit: Brownish-red, round with a few scales 2.5 cm long. Notes: This appears to be a very variable species. 1) Faundez, L., Walter, H.E., Guerrero, P., Saldivia, P. & Avilés, R. 2013. 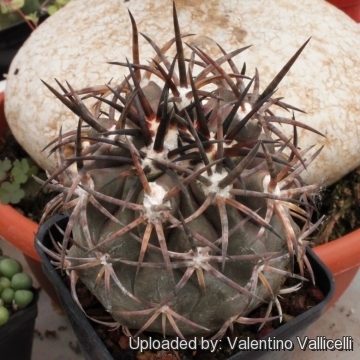 Copiapoa echinoides. The IUCN Red List of Threatened Species. Version 2014.3. <www.iucnredlist.org>. Downloaded on 08 May 2015. 8) Wikipedia contributors. 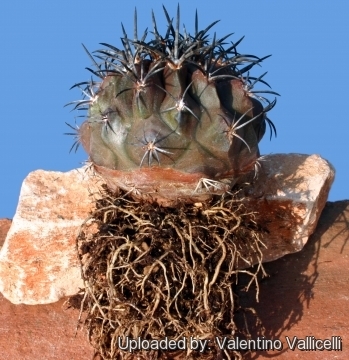 "Copiapoa echinoides." Wikipedia, The Free Encyclopedia. Wikipedia, The Free Encyclopedia, 18 Nov. 2014. Web. 8 May. 2015. 11) Michail Belov. 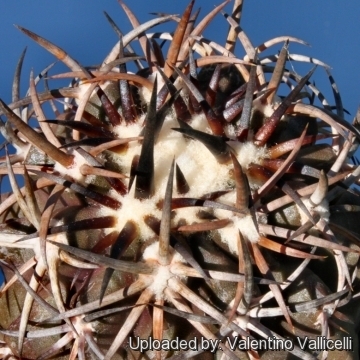 "Encyclopedia of the Chilean Flora: Copiapoa echinoides" http://www.chileflora.com Web. 8 May. 2015.